I’ve always wanted to take some time and visit Chatham Vineyard and Winery up on Church Neck in Machipongo. Chatham is quite unique in that the vineyard and winery, which opened about ten years ago, are part of a large Eastern Shore of Virginia waterfront farm called Chatham Farm which includes a spectacular federal period brick home built in the early 1800’s. 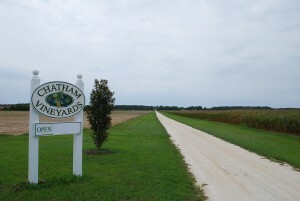 According to their website, Chatham Farm has been a working farm for over four centuries. So… a lot of history in each bottle of their wine. Well, last Saturday I finally made the the time and was so glad that I did. Chatham has a number of special events each year including “Corks and Forks” which I think sounds very tasty. Anyway, we bought tickets to the kick off event of the Chatham Summer Concert Series. Dinner , which started about 7 pm, was delicious ! Savory grilled chicken with various cold salads and fresh picked corn on the cob, well prepared by local Chef Terry Flynn. Of course the wine was great too. Chatham specializes in a full bodied merlot but on Saturday night they served a well chilled sangria made especially for the event. My husband and I both agreed that it was really fantastic. 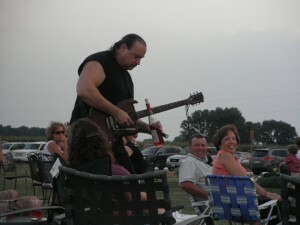 The after dinner entertainment on Saturday night was performed by the Tom Larsen Blues Band. The band was billed as “dynamic, original and exciting , an energetic and danceable show” — it definately lived up to its reputation. Tom Larsen completely engaged the audience with his creative guitar playing. To demonstrate his guitar talents he used as a guitar pick, among other things, a wine bottle, a chair leg ( with the chair still attached) and even a flip flop. My son especially enjoyed the guitar tricks, thought they were the best part of the evening. Whenever I’m in town with my kids we usually take a few minutes to stroll the Cape Charles boardwalk because something interesting is always going on there . You just never know what you’ll get to see but chances are if there is a good wind, chances are you’ll see some folks kiteboarding off the Cape Charles town beach. Getting to watch the athletic grace of kitesurfing at sunset is unexpected treat. The terms “Kiteboarding” or “Kitesurfing” are used interchangeably when discussing this internationally popular sport. ( Here on the Eastern Shore of Virginia it’s always referred to as Kiteboarding. ) If you’ve never had the pleasure of watching someone kiteboard, it’s done by using a huge colorful kite that looks like a skydiving parachute to harness the wind and lift yourself up onto the board and just sail off. With speeds of up to 50+ miles per hour it’s definitely not for the faint of heart ! Kiteboarding is a great alternative for locations like Cape Charles that do not have the super big waves needed for conventional surfing. The picture shows Erin Harvey having a great time Kiteboarding off the Cape Charles beach. After watching several exciting sessions, my sons and I agree that we are all interested in learning to Kiteboard ! Erin has assured me that I can do it, though I must admit I’m a little more than apprehensive about it. I suppose that is what taking instruction is for and it really does it look like fun. Definitely on our bucket list. You are currently browsing the Life and Real Estate on the Eastern Shore of Virginia blog archives for June, 2010.